29th January 2019 - sorry I haven't updated the website with the date but everything is in hand! I'm getting on with the paperwork, prizes and marshalls. Fay from the Cricket club is going to do food and there's not much else to say! Check back for updates! 26th January - Well I'm gald we didn't get today's weather! Thank you to everybody for coming along and running. A bumper year of Entries. Juniors 58 Entries up a lot from my usual 30! And what is impressive is the number of older runners as my U16 course is a tough one so well done all Juniors. And then, helped by Penistone using the race as a Club Champs, the Senior Race also had a bumper entry of 74 Seniors, up from the usual 60. All of this combined with my key helper (Keith Holmes) away and cows calving at 11pm and 6am! ....meant I was slightly overawed by it all. But thanks to Ian Charlesworth, Andy Plummer and Bernice Nixon for stepping in. Plus all the other helpers and marshalls I had. Please all do come back next year! I've uploaded the Results to 2018 Results Photos were being taken by Dave and Eileen Woodhead and are uploaded here - www.woodentops.org.uk Thanks to Dave for his great enthusiasm and cheering too!!! 8th January 2018 - I have the date organised for the 2018 Junior and Senior Races which is Sunday 25th February. All other details are exactly the same as last year. 26th February - Today the races went very well and there was an increase in numbers both in Juniors and Seniors. Well done all you runners as it was slightly muddy in places! Thanks to Charmian, Steve, Keith Holmes, Teresa and Nick, Ian Charlesworth and Hopton Mills Cricket Club. The prizes were donated by MyRacekit, the Trunce and with cakes made by me! Let me have any photos and I'll add them to the Gallery! 30th January - I can't believe I forgot to update the website with the date of this years races. Well they are Sunday February 26th. I've moved it into February to avoid other race clashes, Mothers Day and Easter. However the Junior prizes will all still be Easter related and the Senior ones too with a bit of alcohol thrown in for good measure! 6th March - I have purchased the Easter Eggs, wine and beer for prizes! Fay is primed ready to make bacon/ egg/ sausage butties and soup and the Cricket Club will be open for teas, coffees and cakes! 20th February 2016 - Organisation is underway for the 2016 Races! The Junior Races will now finish in the Cricket Club field and I've slightly changed the Senior route so it Starts and Finishes at the Cricket Club too! Spectators can then eat and drink and cheer the runners through the Finish!. The Changing rooms will be available for changing in and thanks to Andy Plummer at The Trunce for his donation which enables me to buy all the beer, wine and Easter Eggs! Parents please tell your kids there is a free Easter Egg to all runners and lots of prizes! 3rd January 2016 - The date for the next Hoppits Races is Sunday 20th March - the week before Easter so once again many chocolate related prizes!! Hope to see you then. 15th March 2015 - Many thanks to everybody who came along to help or to run today. As I ran in the Haworth Hobble yesterday I had left myself a huge task in marking out the course and getting ready but with much help from Keith Holmes we were ready this morning. Thank you to all the people who came along and marshalled or helped at Registration. Thanks to Jeff at One Step Books for his prizes; it's a shame he is giving up but a living has to be made somewhere. The forecasted rain did not appear and I think running conditions were good. We had an excellent turnout of Juniors with good competition in all categories. Many thanks to Holmfirth who had it a a Junior Championship. There were less runners than last year in the Seniors even though Penistone Footpath Runners had it as a championship race. I got a lot of very good feedback about the courses and races so maybe I will move it off Mother's Day next year to entice a few more runners along. The Cricket club were pleased with the sale of bacon, sausage butties, hot dogs, etc. Next year they will buy a bit more beer and bacon! This race is run in conjunction with trying to raise money for the Cricket Club and so everything helps. Because of the number of cows on the course in summer I will not be running another race this year. Sorry about this but cows and the lack of numbers in August just make it unviable. So hope to see you all again in March 2016. 13th March - I called in to Thermos Online (who are based in Mirfield) earlier this week to ask if they would donate some prizes for the Junior races and they said to call back. I haven't had time yet then just this evening a lady very kindly called in at the farm and left the prizes with my next door neighbour. How lovely is that! Everything else is organised. Registration will be in the Cricket club this year and they will be selling bacon and sausage sandwiches, baked potatoes and hot dogs. There will also be tea, coffee, cakes and beer on sale. I am hoping the weather is better than forecast otherwise it could be a bit damp but we'll all just have to squeeze into the Cricket club for prize giving! 18th February - I've put all the routes on OS Getamap so they are in the Seniors and Juniors info pages now. I've changed the Start of all the routes except the Red (6 to U8) so that they are nearer the Finish field. This year Registration will be in the Cricket Club and Jeff Miller from Third Step Books will be there selling his books. 14th February 2015 - Plan are underway for the Spring Hoppits Races. The Cricket Club are going to put on sausage, egg and bacon sandwiches at a cost of £2 as well as tea and cakes. 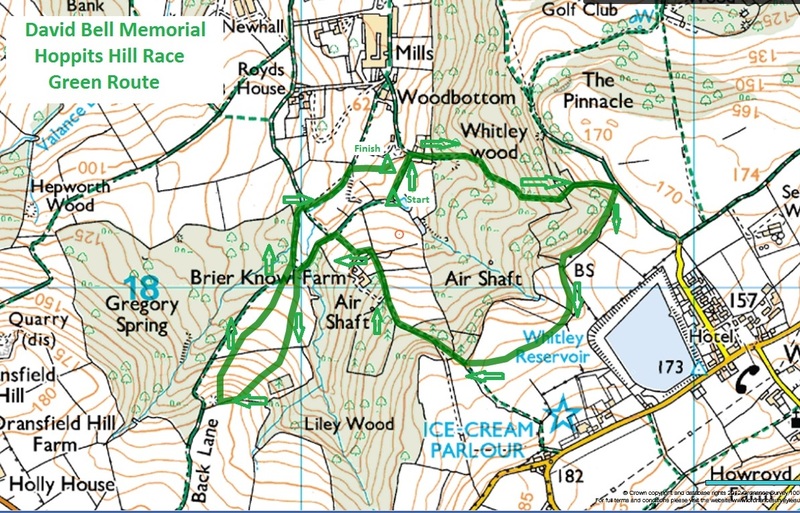 I've changed the Green route as below and am producing all the maps on OS Getamap now so they will all have contours on! 25th August 2014 - Well it's raining as I type this on Bank Holiday Monday! The sun shone yesterday and it was lovely running conditions. We had a much better turnout than last year - 16 Juniors and 32 Seniors took part. Many thanks to Steve Burgess and Andy Plummer who took control of cattle management, to Teresa Wall who took control of the most complex marshalling point, followed by Willy Kitchen on the summit of Hoppits. Well done to all the Juniors who completed; these aren't the easiest of races to complete especially for first timers! And to all the Seniors; I felt quite mean watching you come through the Start/Finish field not knowing that the beast of David Bell hill was just around the corner. It was good to have some of David Bell's family competing - we should introduce a special Team prize for you all. Many thanks to MyRaceKit for the selection of books, to Chris, the landlord at the BlackSmiths Arms, Kirkheaton, Jeff Miller of Third Step Books, and Jeff Rathmell of Charlottes Icecreams for the vouchers they donated. The Festival of Cricket day was coming to a close when we left at 6pm after sampling some beef burgers washed down with Yorkshire Blonde; all in the spirit of cricket and in memory of David Bell. 16th August - Jeff Miller from Third Step Books is going to set up his bookstall as at the Spring races and the Trunce. Have a look at his great selection of new and secondhand books online and contact him for anything special. The medals have been made and the special cow centres were hand delivered yesterday by Rotherham Engravers. Now just needs the ribbons and I'll post a photo as they look great. Just a reminder - It is ENTRY ON THE DAY - there will be forms at Registration for both Juniors (and Parental consent forms) and Seniors. 14th August - Thanks for the offers of Marshalls; I'm still in need of about 6 to 8 and will be baking Cornish Pasties and cakes as sustenance for anyone marshalling so please get in touch. many thanks to Colin and Elisabet from MyRacekit for providing vouchers for category winners. I've been busy baking and buying other prizes!!! 1st August 2014 - I've just bought a strimmer so I'll be out next week cutting back the nettles along the footpath. I've also bought a tent this year so will use that for Registration. We have the FRA Gala tent as well for changing in. The Cricket Festival is well under way and looks like being a good event again so if you can stay around after the races there will be a lot to do, watch and eat/drink! 30th March - A very successful day - thanks to Brent, Steve, Ian and Keith for helping out plus everyone else who marshalled. Thanks also to the sponsors who provided all the many prizes who were MyRaceKit, Genki Gear, Third Step Books and Rockwood Garden Centre. We had a total of 34 Juniors and 69 Seniors which is a very good tally and a good spread of clubs. Thanks to Penistone Footpath Runners for their support and also Stadium Runners for making Hoppits their championship race and providing the loudest and most enthusiastic Finish line gusto!! Even I got so caught up in it I forgot to look at the watch. I've been round Dewsbury and Huddersfield Park Runs giving out flyers, Keith Holmes has been giving flyers out and Penistone Footpath Runners have been promoting the races. I'm trying to get a good selection of prizes together for both the Junior and Senior races - see the new Supporters page for the list of current supporters. I'm hopeful that I can get more next week. If I get enough then I'm going to award separate category prizes to Stadium Runners as it's one of their Championship Races! Paul Elliot is making the medals as shown below so make sure you Juniors turn up to win a bespoke Hoppits Hill Race medal! The new Cricket Club changing and toilet facilites are coming on but won't be ready so I have the FRA tent for Men's changing and this tent (kindly donated by Mark Harvey) for Ladies changing - it might just need some curtains. Jeff Miller from Third Step Books is going to set up his bookstall at the Spring races. Have a look at his great selection of new and secondhand books and bring along some money. He has some real classics for sale! I've had a few emails asking whether it is Entry on the Day as it's not clear on the website or flyer? It is ENTRY ON THE DAY - there will be forms at Registration for both Juniors (and Parental consent forms) and Seniors. 18th Feb - The Cricket Club have confirmed that they will be serving real ales, soft drinks and teas/coffees. They are also going to put on Hot dogs £1.50, Hot beef sandwiches £2.50 and Baked potatoes with beans/cheese for £2.00. I've been round the local business I know asking for donations for prizes and have added them to the Supporters page. Anyone wishing to donate anything - large or small - contact me! 9th February 2014 - I've produced flyers for the Hoppits Spring races that are downloadable here: 2014 Hoppits Races Flyer And I'll be giving them out throughout February and March. As I didn't receive any Pre-Entries last year I'm not doing them this year so it's all Entry on the Day. 25th November - New Spring date for the Hoppits Junior and Senior Races - Sunday 30th March 2014 - Juniors 11.30am and Seniors at 1pm. Exactly the same routes and entry fees as in 2013. The races will also be held on Sunday August 24th (Bank Holiday weekend). 28th August 2013 - The results are up! Thanks to Mark Pearce for the wonderful spreadsheet that calculates them all. I'm considering running a Spring edition of these races so keep checking the website for information. 26th August - The races were yesterday and apart from a lower than hoped turnout of runners (especially in the Junior Races) they all went very well and everyone seemed to enjoy the races. The Senior race was won by Annabel Mason with her father; Ted Mason coming in 2nd and this was after they both went wrong and I managed to shout them back from half a field away!! Many thanks to all the Marshalls who made the Junior races possible, the runners and their parents who came along, Andy Plummer from the Trunce for his donation which paid for the wine/beer and Race Kit who provided the Patagonia teeshirts for category winners. We raised £100 for Kirkwood Hospice which Jonathon Bell was very thankful for and all the Bell family were very touched that I wanted to run the races in memory of David Bell. Me, Steve and Brent spent all afternoon at the Cricket Club enjoying the atmosphere and watching laid back cricket; where the umpire has a beer in his hand !! I have collected the finishing equipment - funnel, tents, time/number recording paperwork and watches from Andy Plummer after the Trunce. All the pieces for the Junior medals have arrived and I have put them together. They look really good. The outers were made by Paul Elliot earlier this year and the centers designed by Lydia and Phil English of Genki Gear (Lydia is my sister). The actual centers were made by Rotherham Engravers who come highly recommended by Penistone Footpath Runners and A.C. The prizes have arrived from Race Kit and are Patagonia technical teeshirts in both men's and ladies sizes. AND the weather forecast is currently good......!!! 12th August - Keith Holmes and I have been busy planning. I've secured the removal of all lively cows from the fields we run through (mainly ours! ), the Finish field has been mowed, Steve has cut a great swathe through the worst of the brambles with his new "topper" and everything else is in hand. RaceKit have offered to sponsor the Senior races with prizes from Patagonia which is brilliant so thanks to them. The medals for the Junior Races are nearly complete; I ordered ribbons last night and I will be buying suitable finishers gifts for all Juniors to receive. Mark Pearce (from Trunce fame) is working on the Results spreadsheet and I should think planning to get results out before the all the runners have finished - as is his speed! 8th June: I have found this link to a report by Kirkwood Hospice in 2012 Lower Hopton Cricket Fest which gives you a flavour of what else will be going on during the day apart from racing! 5th June: After talking the race finishes through with Keith Holmes and Jonathon Bell we have decided not to use the Cricket field but this field that is next door so that we don't disturb the cricket matches and can also spread out!! Unfortunately for the competitors it will mean an uphill finish!